Help your kids get excited about learning God's Word! The NKJV Early Readers Bible offers the respected New King James Version® translation and 192 pages of helpful maps, charts, articles, study tools, and more. 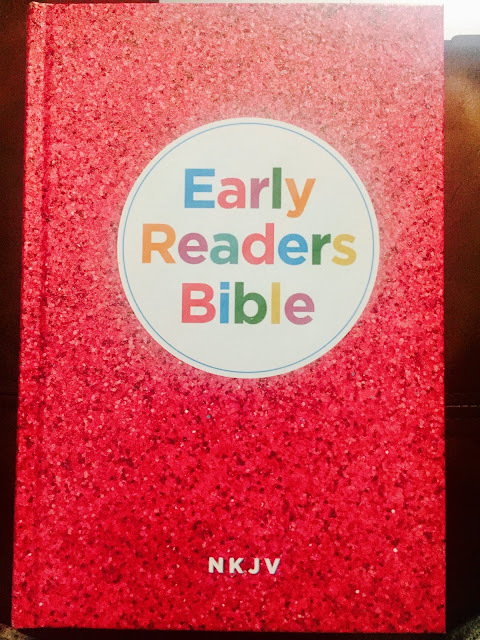 It's the perfect first full-text Bible for children ages 7 to 10, and it comes in a fun, shiny foil cover they will love. This Bible is a wonderful first Bible for early readers to help them know God, understand His Word, hide it in their hearts, and build important Christian character traits in their lives. My Thoughts: Bibles can be pretty intimidating for early readers, and getting a good mix of easy/fun to read and consistent with the original version can be hard. So I was interested in reviewing this Early Readers Bible to see if it passed the test, when it was offered to me by the publisher so I could do so. First of all I love the pink glittery cover (although it might scare off some boys). The print is big and easy to read and there is a good amount of illustrations and diagrams to further illustrate things. The latter is great for kids who might get hung up without it. Overall a great book for readers 7+.